This home freeze warning light is designed for locations which may be vacant in the winter. The flashing light will alert a watch person that the inside temperature is dangerously low. Your home watch person should immediately take corrective action to prevent freezing water pipes or harm to plants or pets. Featuring solid state technology with low-power consumption, utilizing LEDs for the flash signal. Freeze Flash - with adjustable thermostat provides low cost protection against heat loss and water pipe freeze ups. When water pipes break– ceilings fall, furniture and carpets stain and walls and floors come apart. "To be forewarned is to be forearmed". The advantage is this low temperature warning light is powered with 2 D-cell batteries and does not require 120V house power. A utility failure will not effect Freeze Flash's operation. There is no power drain on the batteries until the unit is flashing and it can flash up to 400 hours continuously. Batteries should be removed when not in use and new D-cell Alakine batteries installed at the beginning of the Winter season. 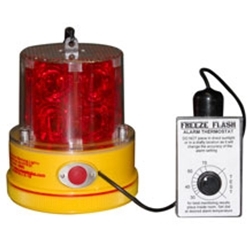 The Freeze Flash low temperature warning light has an adjustable thermostat settings from 30F to 70F with a 4 foot cord. This enables the thermostat to be used in the housing or to be positioned out of direct sunlight or drafts that may not indicate true room temperatures. The thermostat acts as a test switch as well as setting for the temperature for the warning light. The Freeze Flash has 360 degree visibility. Copy and Paste this text into a word document and pass out to your neighbors. Thanks for helping me monitor my house while I'm gone. Or if we have discussed it, please investigate the problem in my home. This is also good for security reasons! Flash Rate: 60 double flashes per min. Overall Height: 5 1/2", Width of base: 6 1/2", Depth of base: 3"
Brightness/Visibility: 5-6cd / 360 degree visibility - over 1,000 ft.